I’ve long said that End User Computing (EUC) is here to stay, whether we like it or not. EUC applications such as spreadsheets and database tools can provide a significant benefit to companies by allowing humans to directly manage and manipulate data. Unlike rigid systems like ERP, EUC offers flexibility to businesses and users to quickly deploy initiatives in response to market and economic needs. However, EUC has become the villain in the big data story. EUC flexibility and speed often lacks lineage, logs and audit capabilities. The risks of the incomplete governance and compliance mechanisms of EUC are not new. Organizations are pretty aware of the accidents they cause: financial errors, data breaches, audit findings. In the context of increasing data regulation (like GDPR and IFRS) companies struggle to embed EUC in a safe way in their information chains. GDPR (General Data Protection Regulation) was enforced on May 25, 2018. It is a legal framework that requires businesses to protect the personal data and privacy of European Union citizens. Article 32 of the GDPR addresses the security of the processing of personal data. These requirements for data apply to EUC as well. Article 17 provides the right to be “forgotten” for any individual. Companies have to precisely control data so there is no leftover data lying in unmonitored applications if the user decides to be deleted from all the systems. The recent financial penalty of 53 Million euro against Google is a concrete example of what may happen to other companies. In accordance with GDPR, Google was fined for lack of transparency, inadequate information and lack of valid consent regarding the ads personalization. The challenge of EUC applications: they generate data that largely remain in silos, also known as dark data. IFRS (International Financial Reporting Standards) aims at bringing transparency, accountability and efficiency to financial markets around the world. The new compliance requirements, like the new IFRS9 and IFR17, include data at much more defined levels than ever before. Data that currently flows to and from EUC has to be traced, linked and precisely controlled by knowing its content. Having a higher emphasis on the control environment, workflow and ability to adjust at a very detailed level is key as disclosure and reporting requirements increase. Organizations have to recognize that EUC falls under the purview of data governance. Any organization that deals with data – basically every organization – has to manage and control such apps so they are able to act immediately to ensure compliance. The first solution to reclaim control is to gather the company’s entire data footprint together. Both structured and unstructured data in one unique space: a single pane of glass. SynerScope offers an advanced analytical approach to include and converge unstructured and semi-structured data sources. All applications from different back-ends are gathered in a unique space. A single, powerful platform for operational analytics that replaces disjointed and disparate data processing silos. The second approach to reclaim control over EUCs is to track and trace all applications, their data and the respective users. Synerscope combines a top-down overview with all the underlying data records, making it easy to investigate why a certain business metric is off, and where the changes came from. It fluently analyzes textual documents and contracts to help spot the differences between tons of thousands of documents in the blink of an eye. Furthermore, an extra layer on the top of all data to control outcomes and keep data to check for governance and compliance. SynerScope Ixiwa provides a more effective approach to data catalogue and data lake management for business users. Ixiwa is a data lake (Hadoop and Spark-based) management product that ingests data automatically, collects metadata about the ingested data (automatically) and classifies that data for the company. While Ixiwa will often be deployed as a stand-alone solution, it can also be viewed as complementary to third party data cataloguing tools, which tend to focus on structured data only and/or have only limited unstructured capability. SynerScope Iximeer complements Ixiwa. It is a visual analysis tool that has the ability to apply on-demand analytics against large volumes of data, for real-time decision-making. If your organization is concerned about the new IFRS or GDPR regulations and you are searching for solutions to ensure compliance, please contact us to learn more. Microsoft Azure customers worldwide now gain access to SynerScope’s Ixiwa and Iximeer products to take advantage of the scalability, reliability, and agility of Microsoft Azure to drive application development and shape business strategies. Helvoirt, The Netherlands — February 7, 2019 — As an innovator permanently pushing boundaries in big data information technology, SynerScope today announced the availability of its products Ixiwa and Iximeer in the Microsoft Azure Marketplace, an online store providing applications and services for use on Microsoft Azure. SynerScope’s customers can now take advantage of the scalability, high availability, and security of Azure, with streamlined deployment and management. “We are very happy to be part of the Microsoft Azure Marketplace. For us it signifies the next step in our development and confirms that we bring a much needed value to the market: where others focus on building the data lake, we focus on bringing that data lake to value by getting data, extremely fast, in front of people in as many facets of your organization as possible,” said Jan-Kees Buenen, CEO, SynerScope. SynerScope is an innovator: permanently pushing boundaries in big data information technology. We create new visions and next-generation solutions by working with multiple kinds and massive amounts of structured and unstructured data simultaneously, resulting in easy to use, affordable, and highly effective technology to support you when you need data the most. SynerScope helps you make important strategic and daily operational decisions and helps reveal new strategic business opportunities at a glance. Over the last few months we have had the opportunity to present our SynerScope Ixiwa solution to many prospect corporations and potential business partners. I have learned a lot from these conversations, both on how to make our offering even more user-friendly, as well as on which technical developments should be prioritized. The most interesting insight however that I got from all these meetings directly results from having truly disruptive technology: generally people do not believe some of the things Ixiwa can do. They think it is too good to be true. For example, people do not believe that we can tag, analyze, categorize and match content of a data lake at a record level without having pre-created metadata. Other people struggle with believing that we can match structured and unstructured data without pre-defined search logic. They question if our patented many-to-many correlator truly can group content, elements or objects in logical clusters. Or they wonder if it is true that business users can easily add and use data-sets in the lake without IT support. Frankly stated: they think we oversell the capabilities of our platform. So we learned we need to show what we can do as early as possible in the relationship; we demo on real data in a real data lake in a live environment so that our partners and clients can first hand experience how our technology works. And when we get to this point, people become enthusiastic and brainstorm about the projects they could do with our technology. Which of course is what we want; deploying our technology to help customers and partners get faster, high quality and value generating insights out of their data. So please do us a favor and give us a chance by allowing us to demo our capabilities, even if you don’t immediately believe our story. We promise we won’t disappoint you. The Netherlands, April 4, 2017 – As every organization is fast becoming a digital organization, powerful platforms that extend the use of data are imperative to use in the enterprize world. By implementing SynerScope on top of your Hadoop, you are able to solve the whitespace of unknown data, due to the tight integration between the scalability of Hadoop with the best of SynerScope’s Artificial Intelligence (AI) including deep learning. The result is a reduced Total Cost of Ownership, working with Big Data and it also creates, extremely fast, great value out of your data-lake. As data science developments happen in your data lake, you currently encounter data latency problems. Hortonworks covers the lifecycle of data: data moving, data at rest and data analytics as a core infrastructure play. Ixiwa, SynerScope’s backend product, will support and orchestrate data access layers and it will also make your whole data-lake span multiple services. Hadoop is a platform for distributed storage and processing. Place SynerScope on top of Hadoop and you gain advantage from deep learning intelligence, through SynerScope’ s Iximeer. It will bootstrap AI projects by providing out of the box interaction between domain expert, analysts and the data itself. “AI needs good people and good data to get somewhere, so we basically help AI to make the best decision in parallel with first insight, then basic rules, then tuning”, says CTO Jorik Blaas. We are proud to announce that as of today Hortonworks has awarded SynerScope all 4 (Operations, Governance, YARN and Security) certifications for our platform, which is a first in the history of their technology partners. If you are interested and want to know more about us, there is the opportunity to visit us at the DataWorks Summit in Munich, April 5-6. We like to welcome you at our booth 1001 as well as at the IBM booth 704 and we will be presenting at the breakout session: “A Complete Solution for Cognitive Business” 12:20pm, room 5. Synerscope enable users to analyze large amounts of structured and unstructured data. Iximeer is a visual analysis platform that represents big insights arising from analyzing AI data into a uniform contextual environment that links together various data sources: numbers, text, sensors, media/video and networks. Users can identify hidden patterns across data without specialized skills. It supports collaborative data discovery, thereby reducing the efforts required for cleaning and modelling data. Ixiwa ingests data, generates metadata from both structured and unstructured files, and loads data into an in-memory database for fast interactive analysis. The solutions are delivered as an appliance or in the cloud. 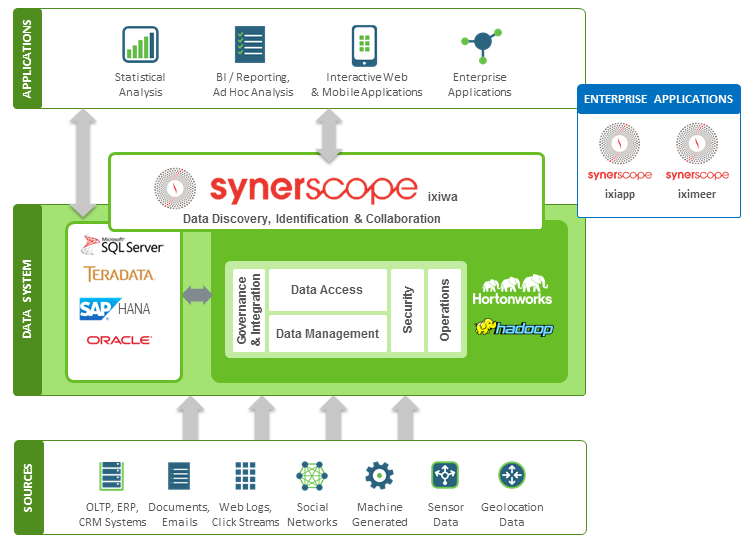 SynerScope can work with a range of databases, including SAP HANA as well as a number of NoSQL and Hadoop sources. SynerScope operates in the following sectors: Banking, Insurance, Critical Infrastructure, and Cyber Security. Learn more at Synerscope.com. SynerScope has strategic partnerships with Hortonworks, IBM, NVIDIA, SAP, Dell.